500 children received bicycles in Kilis. In a bid to convince more people to quit smoking, a municipality in southern Turkey, gave out free bicycles to children whose parents kicked the habit. 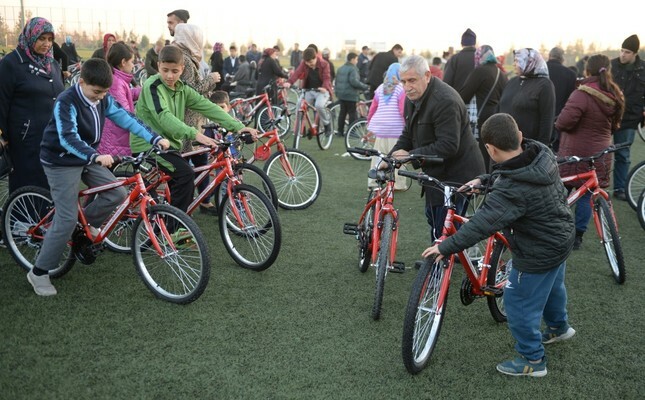 Hasan Kara, mayor of Kilis located near the border with Syria, delivered 500 bicycles to children at a ceremony in the city's stadium on Wednesday. Children, accompanied their parents who signed a declaration to quit smoking beforehand, received their brand-new bicycles at the ceremony. Kara said they already gave out 9,500 bicycles and planned to deliver 5,500 more. In addition to convincing their father, mother or grandparents, children have to have good grades at school, Kara said. Smoking has been one of the habits most associated with Turks for decades, even creating the expression: "To smoke like a Turk." In a multi-faceted action plan against smoking, Turkey banned smoking in all indoor spaces, including restaurants, bars, cafes and similar establishments in 2009. Then-prime minister and incumbent President Recep Tayyip Erdoğan, a staunch teetotaler, is largely credited for the effective implementation of the ban that significantly limited space for smokers. Apart from the ban, the country has imposed higher taxes on cigarettes and provided free medicine and treatment for smokers. Turkey plans more measures against smoking in the coming years. Last summer, the government introduced the 2018-2023 action plan for tobacco control that includes shorter shifts for non-smoking employees at workplaces to raising the minimum age for eligibility to buy cigarettes and other tobacco products from 18 to 21. Turkey will also turn to celebrities, from actors and actresses to popular social media figures to spread the anti-smoking campaign. Messages to deter smoking will be placed on website ads and ads before and during videos in video-sharing websites. Millions will also be texted about the dangers of smoking and passive smoking.